This is the only resort that we saw right on Karon beach, so it has the best views and beach access without a walk. We enjoyed morning walks and spectacular sunsets directly from our room. The staff are friendly and helpful and breakfasts were varied and satisfying with choices of bacon and a variety of eggs, eastern buffet and fresh fruits and yoghurt. The views from the restaurant deck are amazing. Great restaurants are within walking distance with a choice of foods and price brackets. We found the best money exchange and supermarket within 100 metres of the front door. For the Friday night markets and a little more night life action we took a tuk tuk to Karon's main street and enjoyed the music at the Surin Bar. We also visited other a number of other beaches and locations in the area and found Karon to be the cleanest and least pretentious. Being close to the ocean we had no problems with mosquitoes or any other insects. Highly recommended for couples (no children resort) who dont want the large crowds of the bigger resorts. 2nd day in we’re notified that the pool would be emptied and maintenance would commence... hence lots of noise and no pool!!!! Credit to this resort though they re located us at Beyond in Kata... this resort was fabulous !!!!!! Such a beautiful resort set right next to the beach. The breakfasts were great and the amenities were perfectly fine. We love the friendly staff and the overall atmosphere was perfect for a relaxing holiday right near the beach and easy access to the shops. Great local restaurants close by for delicious Thai food and access to transport. We had a fantastic time relaxing at Beyond Resort Karon Beach. I want to go again. 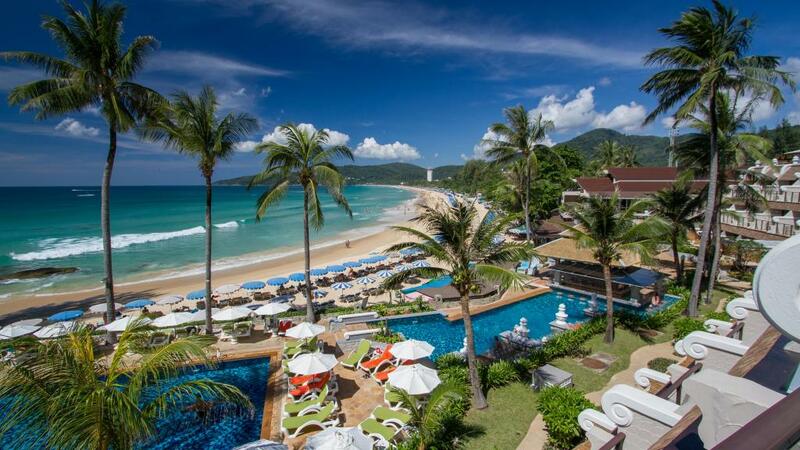 Beyond Karon is a fantastic adults only resort situated on the beautiful Karon beach. I cannot fault this resort. The pool area is great, complete with swim up pool bar . All staff are friendly and helpful.. The resort is perfectly located on the beach and central to shops, restaurants, bars and cafe's..
i highly recommend this property to individuals and couples alike..
My partner and I had a wonderful time and will definitely return. Whilst the hotel is a little dated & in need of repair/refurbishment in some areas the staff make up for any shortfalls. All rooms have sea views but a few have obscured views - best to check with the hotel. Breakfast service & food selection was excellent - great offers at the pool bar. There are a number of small restaurants within walking distance that are both good value for money & tasty. The breakfast buffet was great with the egg station just amazing! My husband had various omelettes each day and I loved the French toast, pancakes and the pastries. More importantly the staff in the breakfast restaurant are amazing. Extremely attentive, great service and really nice people. Would highly recommend to stay here! Thank you for another great holiday at your resort. Location, friendly staff and no kids make this one of the best in Phuket. 2 pools and restaurants on site. Breakfast selection ok but not much variet from day to day. Right on the beach and all rooms have sea view. Great location with restaurants, bars and shops right on doorstep and easy walk to the busy areas of both Karon and Kata. Quiet hotel great for couples. Lovely, friendly staff. Huge comfy bed. Yummy breakfast with lots of choices. Perfect destination on the beach. Lovely renovated rooms now bright and airy. Staff are friendly and accommodating. Perfect place to rest and relax in the sun. Best location on Karon and service was very good. All staff very friendly - special mention Khun Rong at the pool bar and Khun Jim in housekeeping. Thanks for the Thai lessons. Didn't use the restaurant for meals other than breakfast - breakfast was ok.
After spending 12 nights at the Beyond Karon I would have to say it is one of the best resorts in Phuket, all rooms have been recently renovated, have pool ,ocean views and beach views. Breakfast and dining was of a high standard, pool bar drinks very social. Child free resort which is a bonus. Resort is within walking distance to many restaurants and shops. Staff are friendly and rooms are cleaned to a high standard. Overall excellent stay.